Mahindra has launched the TUV300 in the sub-4m SUV segment and have given it a quite a few features. The TUV300 is based on a modified Scorpio chassis and will be offered in three trims - T4, T6 and T8. 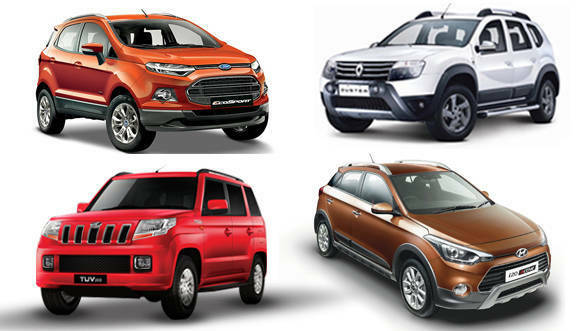 In this spec comparison, we pit the TUV300 against the Ford EcoSport, the Hyundai i20 Active and the 85PS Renault Duster. Although they aren't all in the same category of cars, they do fall in a similar price bracket. The i20 Active covers the hopped hatchback section and has won many a battle with similar cars while the EcoSport takes care of the sub-four metre SUV department. The Duster, although not a sub-4m SUV, still falls in the same price range. The Maruti Suzuki S-Cross and the Hyundai Creta are not in this comparison as they are far more expensive while the Nissan Terrano is more or less similar to the Duster. One major difference between these vehicles is that the Mahindra TUV300 is a seven-seater while the other three are five-seaters. Although the additional seats in the TUV won't be the most comfortable, they definitely count for something. The EcoSport's 1.5-litre diesel engine and the i20 Active's 1.4-litre diesel mill are the most powerful engines of the lot, with 91PS/204Nm and 90PS/220Nm respectively. The TUV300 has the only 3-cylinder engine here and makes 230Nm of torque and 84PS with the 5-speed manual and 81PS with the optional automatic. The TUV300 is the first diesel sub-4m SUV to get an automatic transmission and none of the other diesel cars in this comparison are offered with one. The Renault Duster however, does offer an AWD option in the 110PS version. The TUV300 gets dual airbags and ABS with EBD from the T4+ trim (not offered on the T6), while on the Duster RxL, driver side airbag is standard and the passenger side airbag is optional. The Ford EcoSport gets ABS as standard from the Trend trim, while dual airbags as well as side and curtain airbags come as standard on the third and top-end trims. The i20 Active gets a driver's side airbag and ABS as standard from the mid-level trim, while dual airbags are present only in the top-end SX trim. The Ford EcoSport is the only SUV here that doesn't offer a touchscreen infotainment system. The TUV300 gets a micro-hybrid system and brake-energy regeneration system that the other cars lack. You can find the technical comparison between the four vehicles below.